Today, the US Census Bureau released their annual report on poverty and income. Economists predicted an increase of 1 to 2 percent in incomes in 2015, but the report showed a surprising 5.2 percent increase. A closer look at the data reveals a stark contrast between the economy in urban and rural communities. Over the past 8 years, rural and urban economies have generally exhibited similar economic trends. However, in 2015, there was a sharp divergence (see above). Inside of metropolitan statistical areas (MSAs), median incomes grew by 6 percent. Much of that growth was confined to cities dwellers, whose incomes rose by 7.3 percent compared to suburban and exurban residents, whose incomes rose by a more modest 4 percent. This is the largest increase in median income since before the Great Recession. The poverty rate declined in MSAs, dropping from 14.4 percent in 2014 to 13.0 in 2015. 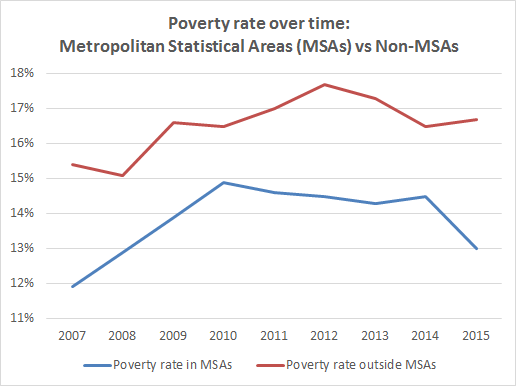 Inside MSA cities, poverty dropped sharply, from 18.9 percent in 2014 to 16.8 percent in 2015, and in the surrounding suburbs, it dropped from 11.8 percent in 2014 to 10.8 percent in 2015. In 2015, rural* median incomes declined by 2 percent, which is just inside of the margin of error. Poverty remained stagnant, increasing a statistically insignificant 0.2 percent in 2015 and settling at 16.7 percent. Regardless of whether the decline in rural economic conditions was statistically significant in 2015, it is clear that rural communities were left behind last year as our economy continued to grow modestly. Rural mortality and out-migration continues to hinder growth in small towns and farming communities. In fact, the number of rural residents living in poverty actually declined by about 10 percent, from 8.2 million in 2014 to 7.4 million in 2015, but because of population loss, this decline was not reflected in an accompanying decline in the overall poverty rate.